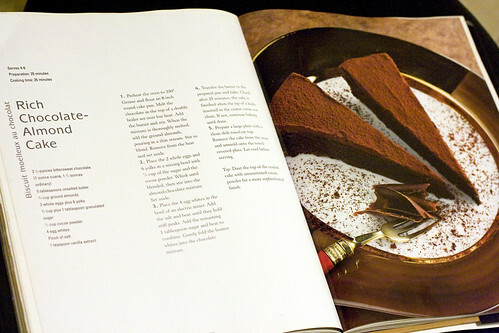 As promised from the previous post, here’s the recipe for my mom’s chocolate cake. 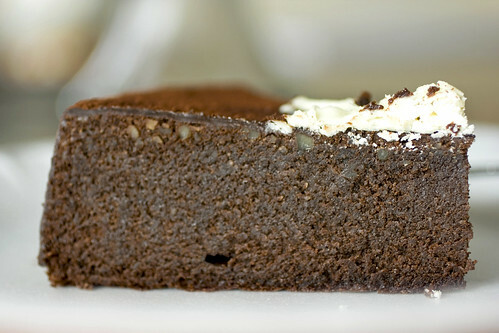 It’s decadent, chocolate-y and nutty from the use of almond flour. Again, I had to make my own almond flour since the grocery stores I shop in don’t carry it. The other changes I’ve done was to add on the chocolate glaze that was left over from my brother’s cake and used Lindt’s Excellence 85% Cocoa Bar for the chocolate solids. What surprised me was the fact that it was easy to make. Preheat the oven to 350°. Grease and flour an 8-inch round cake pan. Melt the chocolate in the top of a double boiler set over low heat. Add the butter and stir then the mixture is thoroughly melted, add the ground almonds, pouring in a thin stream. Stir to blend. Remove from the heat and set aside. Place the 2 whole eggs and 6 yolks in a mixing bowl with 3/4 cup of the sugar and the cocoa powder. 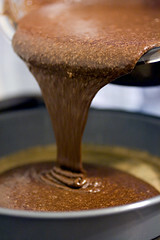 Whisk until blended, then stir into the almond-chocolate mixture. Set aside. Place the 4 egg whites in the bowl of an electric mixer. Add the salt and beat until they hold stiff peaks. Add the remaining 1 tablespoon sugar and beat to combine. 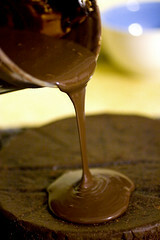 Gently fold the beaten whites into the chocolate mixture. Transfer the batter to the prepared pan and bake. 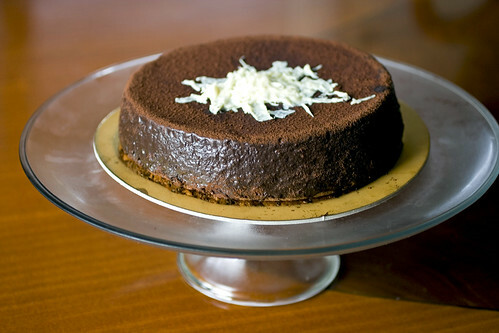 Check after 25 minutes; the cake is finished when the tip of a knife inserted in the center come out clean. If not, continue baking until done. Prepare a large plate with a clean dish towel on top. Remove the cake from the oven and unmold onto the towel-covered plate. Let cool before serving. This looks sooo tempting. Lovely photos. My Sweet & Saucy: Thanks! misstiffie: Try it! It’s soo easy! Maggie: It’s delicious and thanks for the compliment! 1. you mentioned you needed to make your own almond flour but the recipe doesnt call for almond flour? 2. for 3/4 cup ground almonds…is this just finely chopped? (cuz i see small chunks in your pics)…when i see “ground” almonds…i’m thinking almost to the consistency of powder. can you clarify? is ground almonds something i can buy or do i have to buy almonds and ground it myself? 3. for step 1 of the recipe, you’re suppose to pour the ground almonds into the chocolate mixture in a thin stream…how does one actually do that? 4. can you explain the need for unmolding onto the dish towel? do you think i can bake it in a spring-form pan instead and not cool it in a dishtowel? i’m obviously an amateur baker but these are pricey ingredients so i want to get it right! thanks for taking the time to answer my questions. hnahk: You should try! It’s really easy. 1. Almond flour is pretty much the same to me for ground almonds. Technically, yes, the flour is finer than the grounded stuff but since I made this myself with a blender (you may use a food processor) and a not-so-humid evening with a lot of patience not to make this into almond butter, it’ll be slightly chunky. 3. Take a measuring cup full of ground almonds (in the correct amount, of course) and lightly shake the contents out that it should be like a stream. It’s not difficult. 4. You don’t have to do the dish towel. I used a cooling rack. In other words, I took the relatively hot cake (with pot holders on each side) with a cooling rack on top then invert it so the parchment-covered bottom is facing up. You could bake it in a springform pan but the time will vary but it’s best to take off that bottom so it won’t be soggy in that area. beautiful. your results look even better than the book’s. Mmmm. What a delicious looking cake. I will try this for sure. hello, what is the consistency like? Is it like a dense mousse cake or is it spongy? I am hoping the former rather than the latter. kitchenetta: It’s easy…once you have all your ingredients together. curiouseater: It’s in between the two. Light and moist enough that it’s sort of chocolate-y dense. SO NOM. Olivia: Hi! Thanks for visiting me blog! And I didn’t realize it’s gluten-free. Woot! Love this recipe – consider it bookmarked forever! It is a big hit with everyone and satisfies my urge for sweets without being too sweet. PERFECTION!